sculpture, craft, and merging of cultural nostalgia. that are traditionally practiced throughout our history. Commissions and inquiry for existing artworks are always welcome ! ! Please contact me through HERE. Kana Sake Cup is a series of small decorative cups specifically made for Sake. 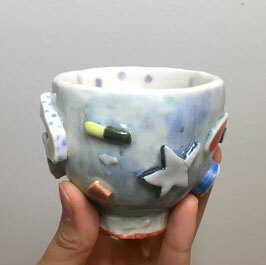 This cup is decorated with playful shapes along with Japanese character indicating the sound of "プ - Pu" purely to enjoy the shape of its cultural lettering. Hand-built, sculptural pot with two legs. Half glazed, half under-glazed with two different blue color. This is a wall hanging flower pot with two openings on each sides.